BodySync Personal Genetics provides advanced nutrition and fitness tools to healthcare professionals, and organizations seeking a proactive and more personal approach to wellness. 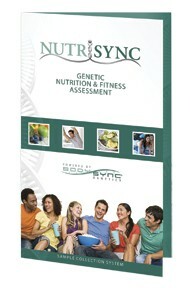 BodySync DNA Nutrition and Fitness Assessments and Solutions Systems are based on multi-patented suites of well-researched gene/nutrient and gene/fitness associations. BodySync's genotyping services are performed in a wholly owned, CLIA-Certified lab. Private customer data is processed through proprietary Gene/Lifestyle Integration technology in secure data centers. Assessment results are interpreted into simple Action Plans designed to improve nutrition and fitness programs. BodySync DNA Assessments target gene/nutrient and gene/fitness associations based on well-researched, clinically-documented genetic correlations to nutrient metabolism and exercise benefit potential. BodySync DNA Assessment and Solutions Systems can provide individuals with valuable insight into gene and lifestyle factors that may play a role in enhanced nutrition and fitness, helping individuals and organizations identify potentially rich new wellness opportunities based on genetics. Understanding how genes, lifestyle and fitness interconnect may provide a great deal of insight about which exercises are most suitable and potentially most beneficial to certain individuals. BodySync DNA Fitness Systems include in-depth genetic assessments, practical action plans and important data that can help individuals and organizations add more precision to exercise regimens and transform personal fitness based on the emerging science of kinesiogenetics. For more information visit www.bodysync.com/nutrisync and learn how this program can assisst your patients to making good decisions with regards to their nutrition and physical fitness programs.